“I was stupid and haughty then, a rebel. I sleep alone now”: Lorenz delivers a tale of espionage and deceit, told with rueful candor. “I didn’t have a happy childhood,” writes the author early on in this update of her 1993 book. That much is already obvious, for a couple of pages earlier, we find her rescued from a German concentration camp, weighing scarcely 45 pounds and unable to stand on her own, one of just a handful of survivors. A year later, an American soldier raped her. Moving with her mother to the U.S. but already certain that she was destined to live a lonely life, Lorenz traveled to Cuba on a ship in the German line where her father was a captain; among her shipmates were a couple of kids from Bremerhaven who would later sneak a tiger cub aboard and who would grow up to become Las Vegas magicians Siegfried and Roy. Not yet 20, Lorenz became one of Fidel Castro’s lovers, his alemanita, “little German girl.” The relationship did not last long, and apparently it was a didactic one, inasmuch as Castro “loved to explain his ideas about agrarian reform” and strike heroic poses. He was capable of flying off the handle, though, outraged when Dwight Eisenhower dispatched Richard Nixon to meet with him so that Eisenhower could sneak in a round of golf. The relationship ended with a pregnant Lorenz suffering a mysterious blackout and waking up without child, treated by a cardiologist and not a gynecologist whom Castro then ordered to be shot—or, at any rate, so she believes. Recruited to assassinate Castro, who blustered, “no one can kill me. No one. 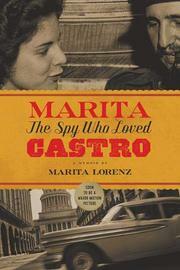 Ever,” she took up with Venezuelan strongman Marcos Pérez, got involved with mobsters (including the one who recruited her to kill Castro), and wound up hearing tales about the assassination of JFK and the Watergate burglary. The congeries of stories has its interest, but Lorenz is an indifferent writer. One hopes that the movie version, to which this ties in, has a little more zing.